Filmed over three years and five continents, Transmutation explores personal mystical revelation amid the obstacles of mainstream culture. Sharing personal stories of individuals who have gone through profound life changes which have altered them for the better. A roving philosopher guides us through the striking forests, coastlines, deserts, and cities of the world, inviting us to embrace the intense mystery of our own existence. Meet the men and women who are living testament to the power of transmutation, each sharing their extraordinary stories of empowerment, authenticity, and love. This feature documentary explores the rarely-seen intimacies of a deeply individualistic mystical experience of reality. "We are treated to a barrage of esoteric symbolism that had my finger on the pause button taking in all those pages upon pages of symbols and glyphs." "Incredible craftsmanship at every level." 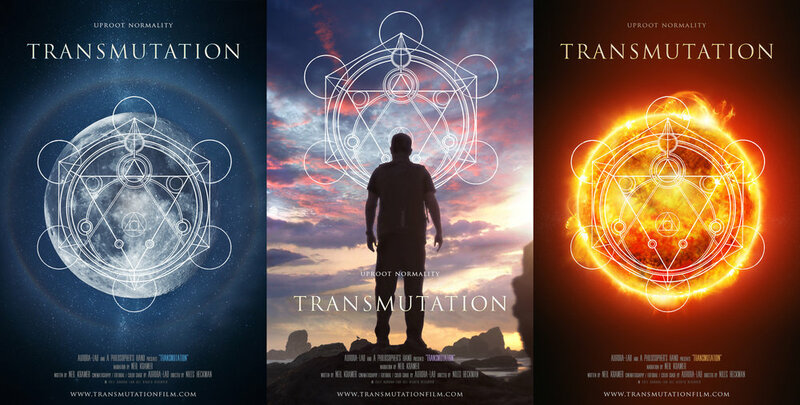 "The transmutation team have given the world a stunningly beautiful film that's overflowing with esoteric riches that may take the viewer years to excavate and unfold." "An abundance of ancient and contemporary wisdom has been compressed into transmutation that it feels like a film that will stay with us for a very long time, and as we change, it's secrets will unlock as we find those keys within ourselves." "With so much being conveyed I never once felt overwhelmed or bombarded by its sheer density of information. It's a film that breaths even though we are being transported through various timelines and landscapes as the images flee off the screen." “Spoke to a deep part of me." "The directing, the writing, the photography, the editing and especially the music all struck a very emotional chord." "You'll want to watch it over and over." Is direct personal encounter with divinity a real thing? What secrets are buried in nature’s deep places? Why has mainstream culture sought to eradicate the awakened human? Is normality really our friend? The answers may surprise you.